← Go Back to School with Schoolhouse Rock! It’s hard to tell who was more excited to meet the other, Ann Hutton or Cow. Definitely a Mutual Adoration Society. Hello Once Upon a Reader Fans! This past week saw Mike and me and Cow edging closer to the end of our incredible tour. On Tuesday morning, Sept 22, we presented to 120 attendees at the gorgeous Winona Public Library. Cow was thrilled to meet one of her biggest fans, Ann Hutton. And Ann certainly knew how to treat a diva like Cow; ever since, Cow has been asking why WE don’t treat her with such adoration. That afternoon we traveled to the small town of Houston and presented to 120 preschoolers to second graders at the elementary school. It was our last SELCO show, were taken care of at every SELCO venue where we performed. Thank you so much, ladies. On Thursday we headed north to present to 90 preschoolers who filled our room at the Grand Rapids library. Another gorgeous site, right on the Mississippi River, and Darla and Tracy could not have been more enthusiastic and helpful. We then wound our way to one of the most secluded sites of our tour, South Ridge School outside of Culver. Cow wanted to take part in the volleyball game that was going on next to us, but we convinced her to perform for the 50 attendees that the Head Start folks had brought in that evening. There were lots of crafts to do and every family got to bring home a book, which is always great to see. 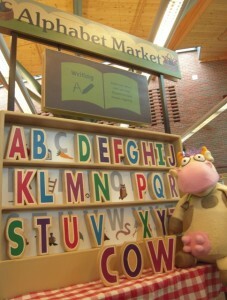 In the wonderful play area at the Grand Rapids Rapids Public Library, Cow spells out one of her favorite words. And now we are packing our bags for the FINAL leg of our tour. What an amazing adventure we’ve had this past year! Here are a few photos from this past week. You’ll hear from us one more time after we return from our final six shows! 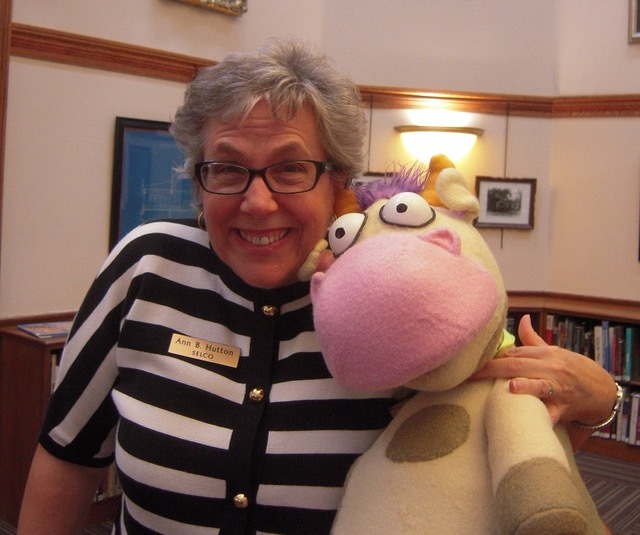 This entry was posted in Legacy and tagged ACHF, ALS, early literacy, Moo!, Once Upon a Reader, one book, OUR, SELCO. Bookmark the permalink.